Looking all around, originally uploaded by in2jazz. 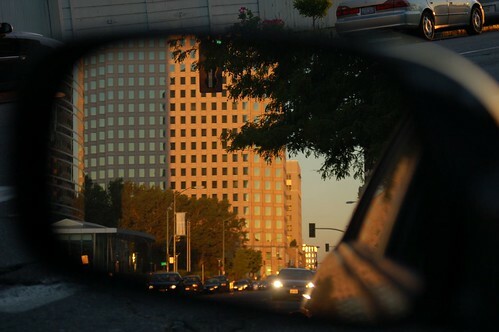 I like this photo because it gives the two perspectives of looking in the rear view mirror and look forward. The image in the rear view mirror looks like it is bursting out of the background. master at work 2, originally uploaded by dralion64. In between baking and writing about music, my other passion is photography. 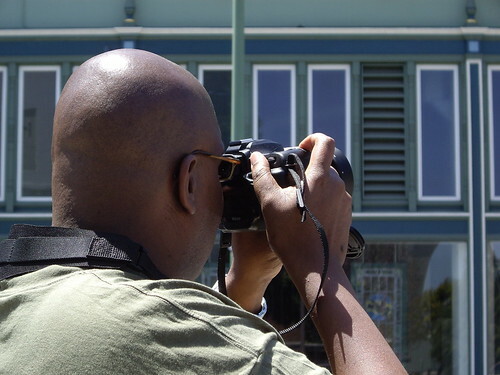 My good friend, J.S., recently captured me shooting while we were walking about Alameda. I got my first digital SLR camera earlier this year and I love it. It is a Nikon D50 and no, I have not given it a name, yet. What I find most amazing is the ability to control how the photo will look. I still have much to learn about my camera especially adjusting the settings for various light but I am having a great time. 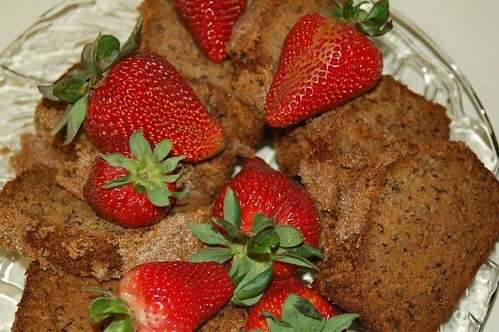 Banana Bread & Strawberries, originally uploaded by in2jazz. This week’s treat is very yummy banana bread. I decided to plate a few slices, garnish them with strawberries and take a few photos. The banana bread recipe is adapted from the Fanny Farmer Pumpkin Bread recipe. Preheat oven to 350°F (180°C). Sift together the flour, salt, sugar, and baking soda. Mash the bananas into a puree and be sure to leave it a little lumpy. Mix the banana, oil, eggs, 1/4 cup of water, honey, and cinnamon together, then combine with the dry ingredients, but do not mix too thoroughly. Stir in the nuts (optional.) Pour into a well-buttered 9x5x3 inch loaf pan. Spread liberally over the banana bread dough before placing in the oven. The aroma will make you want to hurt someone!!! Bake 50-60 minutes until a thin skewer poked in the very center of the loaf comes out clean. Turn out of the pan and let cool on a rack. Makes one loaf. Can easily double the recipe. Thanks to Bakesale Betty for her guidance and mentoring on this yummy recipe. Updated 08/16/2017: Banana Chocolate Chip Cherry Bread: I cannot believe I posted this recipe 11 years ago. I usually make a double batch of the banana bread. Right before folding it into the pans, I add about a cup of dried cherries and chocolate chips to the mixture to make Banana Chocolate Chip Cherry Bread. It has become a big hit and I make it often. Bake for 1 hour and 10 minutes with the added moisture. Enjoy!!! You are currently viewing the archives for June, 2006 at Simply J Life.